The Next Great Computing Platform will be on your face. Current designs will make you look like you forgot to take off the 3-D glasses before leaving the movie theater. "The battle is between immersive functionality and non-dorky, even cool-looking design." AR displays require bulky optical hardware to optimize resolution and provide a wide field-of-view. Adding other features—a microphone, a decent camera, various sensors—also increases bulk and makes it harder to create something comfortable or stylish. If the tech prophets are to be believed, the Next Great Computing Platform will be on your face. It will come as a pair of glasses, as powerful as your iPhone with the panache of your favorite frames. It will pipe your preferred virtual assistant into your ear and give you super-human vision like the Terminator. It will change the way you think of computers, and the way you see the world. The race to make that first pair of commercially successful augmented reality glasses is on, with companies big and small lurching to become the AR platform you wear all the time. It could be Snapchat, with its second iteration of Spectacles. 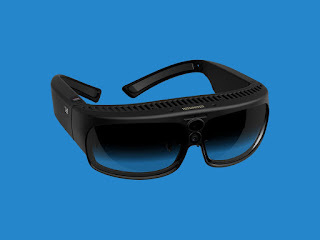 It could be Toshiba, with its new eyewear aimed at enterprise users, or Google, with a remake of Glass. It could be Vuzix or ODG, Intel or Bose, Realmax or Magic Leap. The list goes on and on. "The holy grail is something that not only resembles a normal pair of, say, Gucci glasses, but has functionality that augments your life in a meaningful way." Some of these smart glasses come close to taking the power and convenience of a mobile phone and resting it on the bridge of your nose. But none of the current designs will make you look like you're walking bravely into the AR future. Instead, they will make you look like you forgot to take off the 3-D glasses before leaving the movie theater. For all the hype, no company has come close to creating a pair of AR glasses that actually look good when you wear them. But before the augmented reality revolution can really begin—before glasses can usher in the next wave of personal computing—these devices have to look like something people actually want to put on their face. And that isn't as easy as it sounds. Every company making glasses knows that a winning design has to incorporate both a sense of fashion and an understanding of ergonomics. "All the major tech companies working on this want to reduce friction or resistance to adoption because the plan is that AR glasses will become our universal interface in our everyday lives," says Ari Grobman, the CEO of Lumus, an Israeli company that makes the see-through displays for smart glasses and is currently developing connected eyewear of its own. "The battle is between immersive functionality and non-dorky, even cool-looking design. The holy grail is something that not only resembles a normal pair of, say, Gucci glasses, but has functionality that augments your life in a meaningful way." Right now, that demands a trade-off. The best AR displays require bulky optical hardware to optimize resolution and provide a wide field-of-view. That makes it possible to do all kinds of cool things in augmented reality. But early versions, like the Meta 2 AR headset, look more like an Oculus Rift than a pair of Warby Parkers. Slimmer AR displays, like the used in Google Glass, feel more natural to wear, but they sit above or next to the normal field of vision, so they're are less immersive and less functional. Adding other features to the glasses—a microphone, a decent camera, various sensors—also increases bulk and makes it harder to create something comfortable or stylish. This tension has split the field of AR glasses into two extremes. On one end, you get hulking glasses packed with features to show off the unbridled potential of augmented reality. On the other end, you sacrifice features to make a wearable that looks and feels more like normal eyewear. In the maximalist camp, there's Osterhout Design Group. Its latest smart glasses, the ODG R-8 and R-9, have dual 1080p OLED displays, run Android, and utilize smartphone-class Qualcomm Snapdragon 835 chips. The R-9, the slightly more powerful model, has an impressive 50-degree field of view and a 13-megapixel camera capable of recording 4K video. It also looks like someone glued two pairs of 3-D glasses together. Nima Shams, VP of Headworn at ODG, says the company's goal is to "design the next mobile computing platform." If smart glasses ever hope to become as essential as the smartphone, Shams says, they need to be able to do everything your phone can do. Consumers "expect the amazing TV quality they have at home, they expect the computing power in their pocket, they expect a product that matches their mobile lifestyle," says Shams. "So any product we create that is meant to compete with what they use must meet or exceed those expectations." In the past, ODG has designed its glasses for use in industrial environments. Shams says those customers tend to be more forgiving about the clunky form factor than mainstream consumers, who expect something sleek. "For advanced, high-tech smartglasses to achieve mass adoption they must blend into devices of fashion," says Shams, adding that each iteration of ODG's glasses gets smaller and slimmer as they develop for a broader consumer base. When designing the R-8 and R-9, the company focused on reducing the bulk and slashing the price. The R-7, designed for business, cost $2,750; the R-8, designed for consumers, will cost less than $1,000. On the other end of the spectrum are Intel's Vaunt Glasses, which debuted last month. The glasses have thick black frames and can project phone notifications, directions, and incoming messages onto a tiny display in the periphery. If ODG's R-9 is like an all-powerful Android phone, the Vaunt design is more like a Pebble smartwatch you wear on your face. For Intel, that decision was deliberate. The company eschewed a camera, a microphone, a speaker, and other hardware to keep the frames sleek and lightweight. To call them stylish would be generous, but they come close to something you might not be embarrassed to wear in public. That approach could pay off. As with all wearables, people might be more likely to make an exception for a simple product that looks good versus one that's high-powered but ugly. "When you have two things that are comparable but one thing looks much better and the other functions a little better, people are willing to make compromises for the nicer-looking thing," says Francois Nguyen, an industrial designer and creative director at the design firm Frog. That's especially true with something like glasses. "Something you wear on your face, around your eyes—that better look nice. That's your identity."